NOTE: Linksys strongly recommends that you backup up all of your data onto an external storage device before proceeding with any RAID Setup. If your unit came with a hard drive (HDD) please be sure to leave the shipped HDD in the default Bay 1 configuration prior to continuing with any of these steps! Leave the shipped HDD inside Bay 1. If you need to replace the shipped HDD, A Serial ATA (SATA) HDD from any manufacturer may be used. Maximum size per drive is 2TB (two TERA bytes). Note: If you don't have new hard drive to install but have a "used hard drive" (especially, one that has been used in a Media Hub previously), see Caution section below. Linear 2 Mode will treat the two HDDs as one large drive. 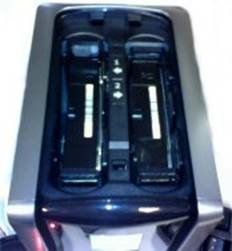 Data will be written across the first HDD until it is full and then it will automatically begin to write the additional data to the second HDD. NOTE: If any of the HDDs fail, all data will be lost. Linear 2 is not the same as RAID 0. NOTE: If you don't have new hard drive to install but have a "used hard drive" one that has been previously used. See Caution section below. Raid 1 combines two HDDs in parallel mode as one drive. Drive two is a copy of drive 1 for data protection against a potential single HDD failure only. Single HDD in Bay 2 is "Not Recommended"
This option is allowed but is not recommended. If this drive is your data drive and a new HDD is installed in Bay 1 and you invoke a Raid 1 operation (increase protection) the chance of data loss is and you invoke a Raid 1 operation (increase protection) the chance of data loss is 100%. The mirror set will be created but there will be no data on it. If this occurs, restore you data from your external backup set..
Be sure to use a new HDD for configuring Linear 2 or RAID 1 mode. 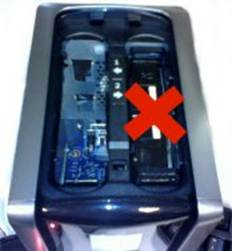 Linksys recommends that you do not install a previously used HDD in for RAID 1 mode or Linear 2 mode. 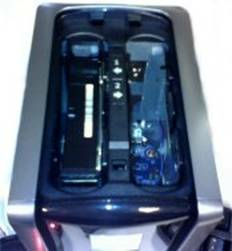 The Linksys Media Hub is designed to mirror the data on HDD in Bay 1 onto the HDD in Bay 2. Before you proceed further, you need to boot up the Media Hub with just the HDD in Bay 1 to verify this is the data you want to preserve, (let's call it HDD1). Power off the Media Hub, remove HDD1 from Bay 1 and install the previously used hard drive (let's call it HDD2) into Bay 2 and boot up the Media Hub. Open the Media Browser and go to Configuration/Disk and click 'Revert to Single Disk Mode'. Now power off the Media Hub, re-install HDD1 (containing original preserved data to be restored) into Bay 1 and the HDD2 (used hard drive) into Bay 2 and power on the Media Hub. The Media Hub will boot using the drive in Bay 2 (now containing no data). The Media Browser hence indicates that there is no data on the Media Hub. Once the Media Hub is up and running, open the Media Browser and go to Configuration/Disk and click 'Increase Protection'. (You can ignore the data loss warning and say 'Yes' for this exceptional case! Warning should be observed for all other situations). NOTE: The data loss warning should be observed for all other situations. The HDDs are now set to RAID 1 and the data on HDD1 (Bay 1) will be mirrored onto HDD2 in Bay 2. NOTE: There is a probability the Firmware version of a Media Hub may be downgraded/upgraded after this procedure since the firmware is stored on the HDDs. The firmware that your Media Hub attains is the same as the firmware you see when you boot the Media Hub with the data drive. So, the firmware shown after the disk mode change might be different from the firmware you originally started out with. You can just go ahead and update the firmware and this doesn't get rid of any of your data or functionality.